Crystal Palace have only interviewed two candidates for their vacant manager's job but hope to make an appointment "early this week". Malky Mackay had been the favourite for the job until allegations emerged of misconduct during his time at Cardiff. 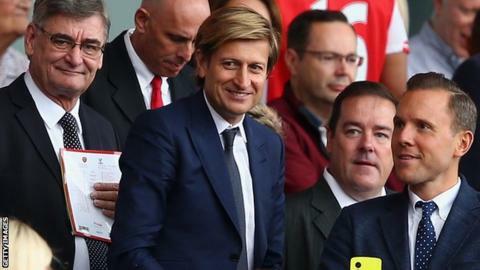 Palace co-chairman Steve Parish has said the process is ongoing. "I have seen very few people, probably two, but I've spoken to other people about managers and doing background work and due diligence," Parish said. "Obviously I hope to try and have someone in the early part of this week, because we have got the transfer window [closing next Monday]." Keith Millen is in temporary charge at Selhurst Park but Parish is keen to quickly appoint a permanent successor to Tony Pulis, who left Palace by mutual consent just 48 hours before the season started. In addition to Mackay, former Tottenham boss Tim Sherwood was also interviewed, but recently said he was no longer interested in the position. Former Celtic manager Neil Lennon has been made the bookmakers' favourite, but told Match of the Day 2 on Sunday he was puzzled by the speculation. "I've nothing to tell you really," Lennon said. "There's been no communication. I don't know where this information to make me favourite is coming from." Former West Brom boss Steve Clarke has confirmed his interest in the job, while former Newcastle manager Chris Hughton has also been linked. Parish told the Croydon Advertiser: "Finding the right person isn't easy. A lot of managers are in jobs and they're not going to leave clubs early in the season, so it's a difficult situation."